“Leather Pass,” or the Rocky Mountain Portage to the headwaters of the Fraser River at Tete Jaune Cache from Jasper’s House (to the east). From a Portion of Alexander Caulfield Anderson’s 1867 Map of British Columbia, CM/F9, BCA. 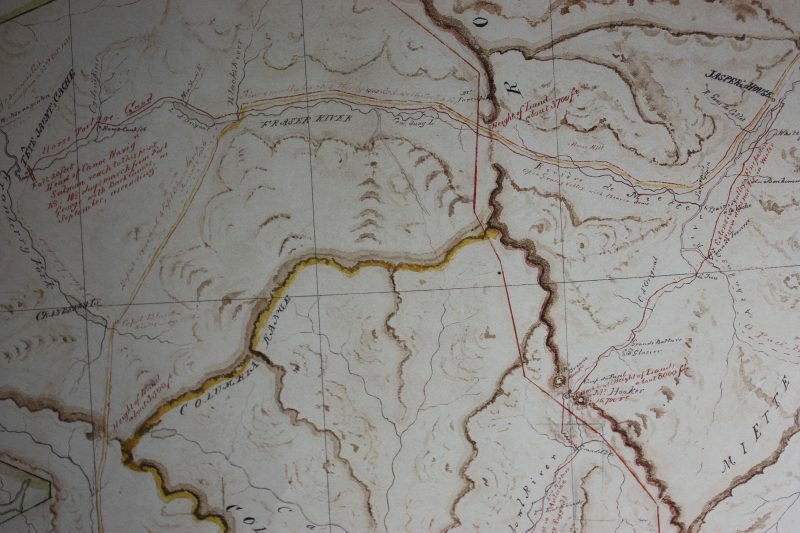 Courtesy of the Royal BC Museum, BC Archives, Detail from original map. The map also shows Capot Blanc’s home camp at Cranberry Lake, and the routes he would have used to go to Boat Encampment and to the North Thompson River (as discussed a few blogposts ago). As a fur trade descendant, I have always called the northern pass through the mountains “Leather Pass.” Today this is officially known as the Yellowhead, which comes from its original name, Tete Jaune’s Pass. My great grandfather called it “Leather Pass” in his writing, and apparently it was known by that name among the New Caledonia men. However, to the HBC, its official name was the “Rocky Mountain Portage,” and so, in my writing, I have willingly adopted that name. It works better, and it seems right. At Fort George, Anderson left the brigade. Ogden had placed him in charge of eight men and two canoes, and he was to travel across this unfamiliar land to the base of the Rocky Mountains and pick up the supply of leather that was being shipped this year through Tete Jaune Pass. They expected this to be a short trip up and down the Fraser River. Anderson waited for the incoming York Factory Express for ten days, and you will discover, when my York Factory Express book is published, the reason why it was delayed. It is important to know, however, that his return journey was made more difficult because “Leather Pass” had not been used for the import of buffalo skins for a few years previously. After the 1835 fiasco (for fiasco it almost was), they returned to the Peace River route once more. The first time the Tete Jaune Pass route was used for the outgoing York Factory Express was in 1827 — one year after the York Factory Express was created. The story is told in this post: http://nancymargueriteanderson.com/george-mcdougall/ It is, however, not exactly true that this is the first time an HBC man went over the pass, as James McMillan explored it, apparently in 1825. Previous to that time, the NWC and HBC men had always traveled out by the Peace River through Dunvegan. In the early years the HBC men of New Caledonia got their leathers from Dunvegan, but as we know from this post, http://nancymargueriteanderson.com/two-canoes-fourteen/ it was no longer possible for that post to supply New Caledonia. Hence, they began to use what they called “Leather Pass.” Let me see if I can figure out in what years they used the pass for importing their leather. As mentioned above, Anderson was sent across the pass for leathers in 1835, and he did make it back, but not without difficulty. The road was rough as it had not been used for a few years, and an early winter brought snow and ice that stopped his party in their tracks and forced him to return to Edmonton House. The story is told in The Pathfinder, and so I need not go into it here. I believe that because of the difficulties he experienced, it was not used the next year. But when he left the territory in 1840, he was first sent down to Fort George to pick up the leathers. Instead he was sent on to Fort Vancouver and someone else went up the Fraser for the leather supplies. In 1827, Edward Ermatinger’s incoming express carried 27 packs of leather up the Athabasca River to Jasper’s House, only fifteen of which were carried across the mountains via “Leather Pass.” There are no York Factory Express journals for the years 1828 to 1834, but we know that for some of those years at least, the leather did not come in by this route. 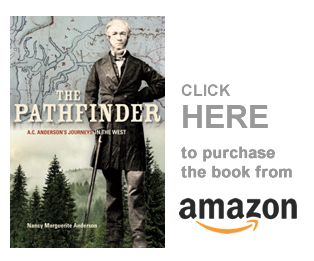 In 1835 James Douglas brought a supply of leather upriver, which he handed off to A. C. Anderson at Jasper’s House. In 1836 it was sent into New Caledonia by the Peace River, but they must have later reverted back to Tete Jaune Pass, as in 1840 Anderson was supposed to go upriver to pick up the leather supply for the territory. By 1847, Thomas Lowe was not carrying leather up the Athabasca River, but otter skins for the Russians, and those went down to Fort Vancouver via Athabasca Pass rather than west by Leather Pass. The recruits from York Factory are again this year ordered in by Tete Jaune’s Cache where they are expected by the 4th of October next and you will please send a Boat to await their arrival at that place and convey them to Fort George. [B.226/b/3, HBCA]. For this decision, made when he was just realizing there would be an extreme shortage of provisions, Manson was scolded both by James Douglas and by Governor Simpson. In Douglas’s letter to James Murray Yale on this subject, we find that the leathers came in by the Peace River, as they usually did at this time. In 1854, the York Factory Express did not make it across the mountains, and it unlikely that the recruits for New Caledonia came in by Leather Pass — perhaps their journey was delayed until spring. Its hard to tell what happened in years later than this, as there are no surviving Fort Alexandria journals, nor are there any for Fort St. James. The York Factory Express no longer ran, but there was no reason why new men for New Caledonia could not have been sent west from Edmonton and Jasper’s House by Tete Jaune Pass. Were they? I have no information that indicates they were. In some years I have so much information I cannot write the chapter without heavy editing — in others I have to tell other stories and ignore those of the northern posts. But that’s not a bad thing, as it happens. There’s lots to write about in those later years. So enjoy what I have discovered, and wonder about what I haven’t, as I do. History has gaps. Huge gaps. Accept it, and move on.